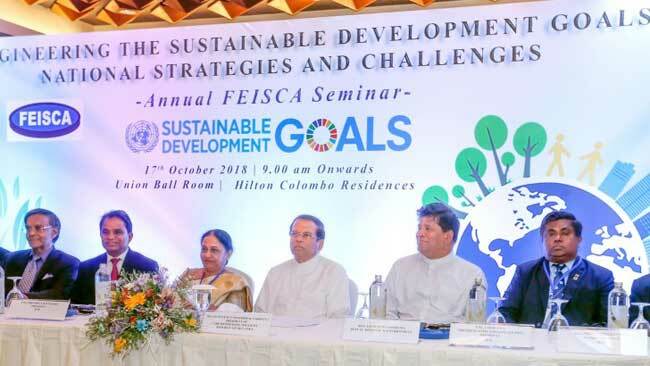 President Maithripala Sirisena asks all the engineers to contribute their knowledge and skills for the nation towards facing the challenges while achieving sustainable development goals. President Sirisena said this addressing the annual conference of Sri Lanka Engineer’s Association held in Colombo (17), stated President’s Media Division. This Conference is organized annually in collaboration with Sri Lanka Engineers Association and Eastern and Central Asian Engineers Federation. This year’s theme is, “Challenges and targets in achieving sustainable development goals”. The representatives of India, Pakistan, Bangladesh, and Nepal also participated in the conference and it is expected to uplift the professional cooperation between the allied countries of Eastern and Central Asian regions towards establishing a productive mechanism, discussing issues and providing opportunities for nongovernmental organizations engaged in the field of engineering education and training. President Sirisena who addressed the inaugural session said that the severe challenges in achieving sustainable development goals are the variations of climatic changes, poverty, challenges faced in building a health safety public, corruption, and fraud. President Sirisena who said that in order to win these challenges everyone should join hands together evading all possible disputes and conflicts said that it is definitely a duty accomplished on behalf of the future generation. President further admitted that as a long tern step to eliminate the flood threats faced by the people residing in Ratnapura and Kalutara, he has instructed to establish committee of engineers to implement a program to channel the huge amount of water wasted and causing floods to the north through tubes. The Chairmen of Sri Lanka Engineers Association Prof. Niranjani Rathnayake, presented a token of appreciation to the president. Deputy Minister Ajith Mannaperuma, Former Chairmen of Sri Lanka Engineers Association Jayavilal Meegoda, Prof. Mohan Munasighe, and other professionals were present in this event.